Our quest to find novel compounds in nature that we can use against human diseases —a process called bioprospecting — has led a research team to a small frog found in India. From the skin slime of the colorful Hydrophylax bahuvistara, researchers reported finding a peptide — a small piece of protein — that can destroy many strains of human flu and can even protect mice against the flu. The findings, by a team from the Emory Vaccine Center at Emory University, the Rajiv Gandhi Center for Biotechnology in India, and the Department of Microbiology at the Icahn School of Medicine at Mount Sanai, was published in the journal Immunity. After capturing H. bahuvistara and giving them a mild electrical stimulation to cause the secretion of protective skin peptides, the frogs were returned to their natural habitat unharmed, and the researchers had their study specimens. They tested 32 frog defense peptides found in the frog slime against an influenza strain and found that four of them had antiviral activity. Unfortunately, three out of the four were toxic to human cells. But the fourth — urumin — was not, and it killed a wide range of flu viruses, later determined to be those of the H1 type. 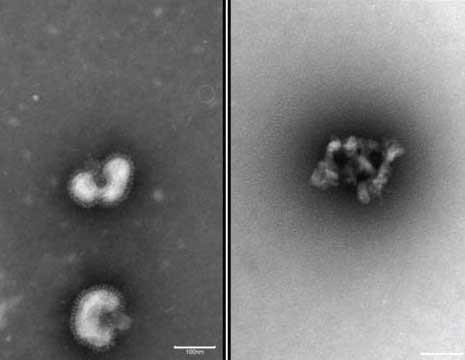 The scientists believe urumin works by binding to H1 and neutralizing the virus. When they tested urumin in mice, it protected them against H1 type flu. There are three types of flu virus with different subtypes within them. Influenza A viruses have two subtypes, based on proteins on their surface, called hemagglutinin (H) and neuraminidase (N). There are 18 different hemagglutinin subtypes, named H1 through H18, and 11 different neuraminidase subtypes, called N1 through N11 — combinations that give each flu strain its name. "I was almost knocked off my chair. In the beginning, I thought that when you do drug discovery, you have to go through thousands of drug candidates, even a million, before you get 1 or 2 hits. And here we did 32 peptides, and we had 4 hits, " said flu specialist and study co-author Joshy Jacob of Emory University in a statement to Cell Press. "We just happened to find one that the frog makes that just happens to be effective against the H1 influenza type." Vaccines remain our primary defense against the flu, but — and this is a huge "but" — their success depends on several factors: First, scientists need to correctly anticipate what flu strains are likely to hit the next year and successfully create vaccines against them. Second, people need to get vaccinated. When the vaccine fails or too few people get vaccinated, it can position the world for a flu pandemic. Urumin was only active against flu of the H1 type, but if that type of epidemic or pandemic happens, we will need more and better antiviral medications — like the one from frog slime discovered by Jacob and colleagues may provide. The number of flu cases fluctuates wildly from year to year, but the World Health Organization (WHO) estimates there are between three and five million severe cases of the flu worldwide each year. An influenza pandemic occurs when a new type of flu circulates globally. This happens when the influenza A virus changes and becomes capable of infecting humans and being spread from person to person. There are two main ways this can occur. One way is called "antigenic shift" and happens when there is a change in proteins on the viral surface that make a non-human flu virus directly capable of infecting humans. The other way is called "reassortment," which occurs when a non-human influenza A virus (like avian influenza virus, for example) exchanges genetic information with other influenza A viruses present in a host and produces a new virus that is capable of infecting humans. One of the viruses, H3N2, in the flu vaccine manufactured for the 2014–2015 season acquired some genetic changes as it infected people during the flu season, rendering the vaccine ineffective against that strain. It made for a severe flu season, especially for people over age 65. Luckily, we ended the 2014–2015 flu season with "only" an epidemic in US — the death rate attributed to the flu was 7.4% in the 122 Cities Mortality Reporting System for the week ending February 21, 2015. This percentage was above the epidemic threshold of 7.2% and defined that flu season as an official epidemic. We were lucky because that flu season ended as an epidemic, not a pandemic. The WHO named H1N1, that started with an outbreak in Mexico in 2009, as the first the first pandemic of the 21st century. It was caused by the reassortment of two swine flu viruses that made them infectious to humans. "Influenza pandemics have been reported for at least 500 years, with inter-pandemic intervals averaging approximately 40 years," according to an article in the journal Public Health Reports. Using this estimate, we might not expect another flu pandemic until about 2040 or so. But, of course, no one really knows when or where or why it will hit. Currently, there are three anti-flu medications on the market. Oseltamivir, zanamivir, and rapivab, by brand names Tamiflu, Relenza, and Rapivab, respectively. All are neuraminidase inhibitors and work against the "N" part of the flu virus. These medications can shorten the duration of the flu by one or two days and prevent serious complications like pneumonia from developing, but they don't really cure the flu and may not be able to contain a pandemic. If a future flu develops having an H1 component, then a product derived from urumin discovered by Jacob and colleagues just might be a useful drug in the fight against that flu type. If pandemic flu predictions do come true, we will need all the help we can get.